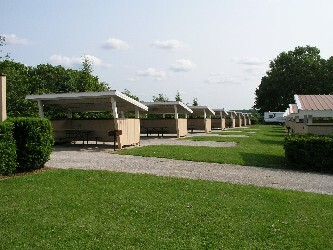 All Year Sites = $56.00 CT 1 through CT 16 are level sites near the pool with shelters at each site. Inside these shelters is a picnic table, over head light, TV shelf, and outlet. All of these sites are paved for handicap assessibility. There is a large group fire ring nearby, but sites CT3,CT5, CT6, CT7, CT9, CT10, CT 11, CT13, CT14, and CT15 now have fire rings.